Thor Smestad looks back on his time at REGUA. “Well I am back in Canada now .. after six fantastic weeks at REGUA. I accomplished what I went there to do – to learn as much as I could about their reforestation program, and also have a great time. I had the opportunity to collect tree seeds in the forest, help with the process producing seedlings from these in the REGUA nursery, and even plant some trees too. I plan to go back .. for the tree planting season – this was only the beginning for me. The constant stream of researchers that stay there too, looking at everything from bats to frogs and owls .. made things even more interesting. 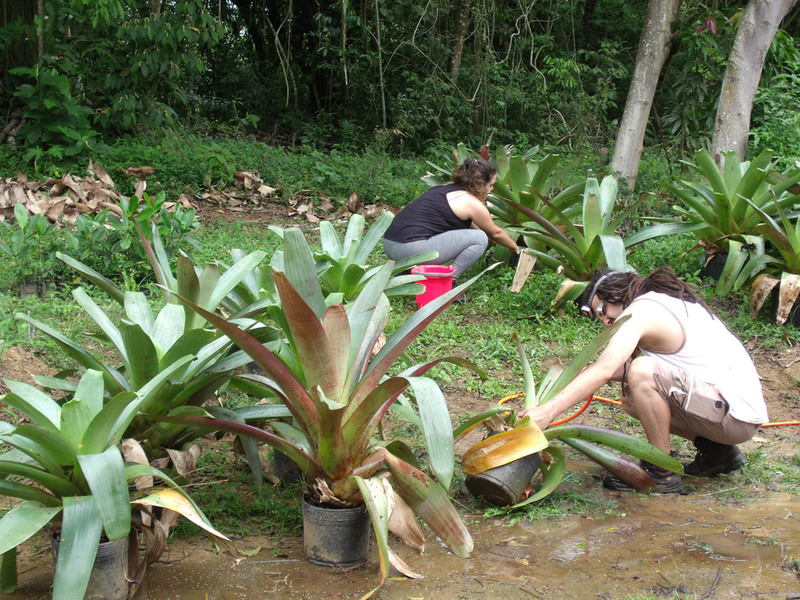 For anyone interested in tropical reforestation and ecology, I highly recommend spending some time at REGUA. Thank you to all the people at REGUA, you were wonderful – and so was the food and accommodation, I think I even put on a little weight. REGUA – the solution to land erosion! Planting trees on degraded soils is never easy. Over time, the soil loses most of its nutrients, becomes compacted, and is very often too steep to even walk on. The land owners give up areas that cannot be mechanized and allow it to turn into poor quality pasture where it can be burned occasionally to keep it free from weeds. Soils lose the carbon granules that bind soil together and slowly micro-bacterial life drains out allowing heavy rain to start ugly gully erosion. These are the soils that REGUA wants to return to forests before they become an ecological disaster zone, an eyesore and are also too expensive to retrieve. Owners are reticent to allow REGUA to convert tired uphill land to forest as they think their properties will lose value. The owners don’t want to sell the land as there is little else to buy with the money. 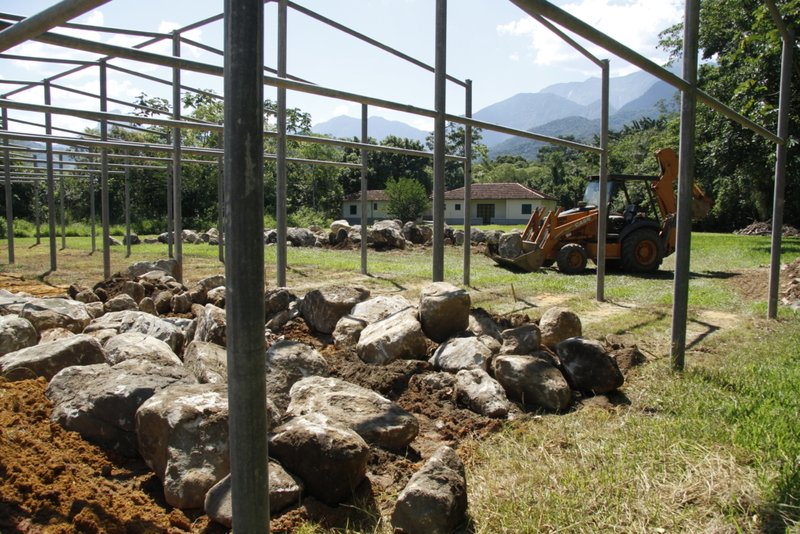 However REGUA has experience and in its stubbornness gently inches forward to improve the Guapiaçu valley. The hillside of the Protestant land is one that poses a challenge for it is currently in grass, very steep and already has some gullies formed by heavy rain. Professor André Tavares Correa Dias of the Department of Ecosystem Ecology at Rio de Janeiro State University, is himself involved in restoring bauxite residual dumping grounds in Pará State visited us and we took him to see our challenges. He was very pleased with the results to date. Our trees are planted just before the rains – the best time to build a forest. We only hope the rains won’t bring the hill down before the trees have time to bind the soil! Last year’s planting season was in November, and the mortality rate was quite acceptable given the factors, so we are hopeful that we will be able to establish these new forests at REGUA to the benefit of the biodiversity, its community and the valley’s overall ecological functionality. 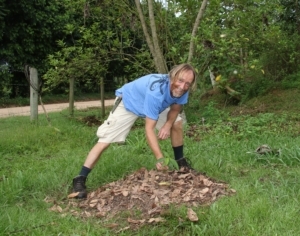 REGUA volunteer Thor Smestad hails from British Columbia, Canada. 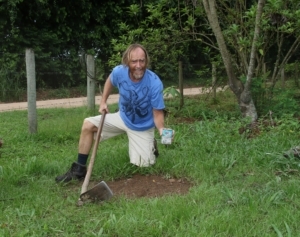 He came to Brazil to fulfill a dream, to plant trees in Brazil. With a diploma in Forestry Technology and a degree in Forest Resources Management, Thor brings a new approach to our propagation model. 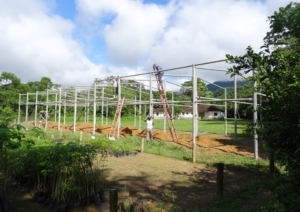 As he is a specialist in propagation from from cuttings he started by taking cuttings from four Brazilian species to test how successful they are in rooting. This would be a major breakthrough in reducing reforestation costs and his cuttings placed in buckets with small air pumps lay in tubs of water waiting to root. 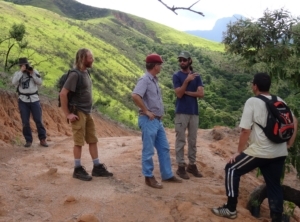 Thor has seen the re-forested areas and the latest areas planted and is amazed at the scale in which REGUA is working. He has offered some valuable contributions in improving the quality of planting. 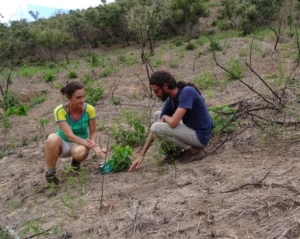 We were able to reward Thor by planting two very special seedlings of “Guarajuba”, (Terminalia acuminate) donated by the botanist Pablo Prieto. We had heard about these endangered trees from Pablo, a senior researcher at the Botanical Gardens in Rio de Janeiro. 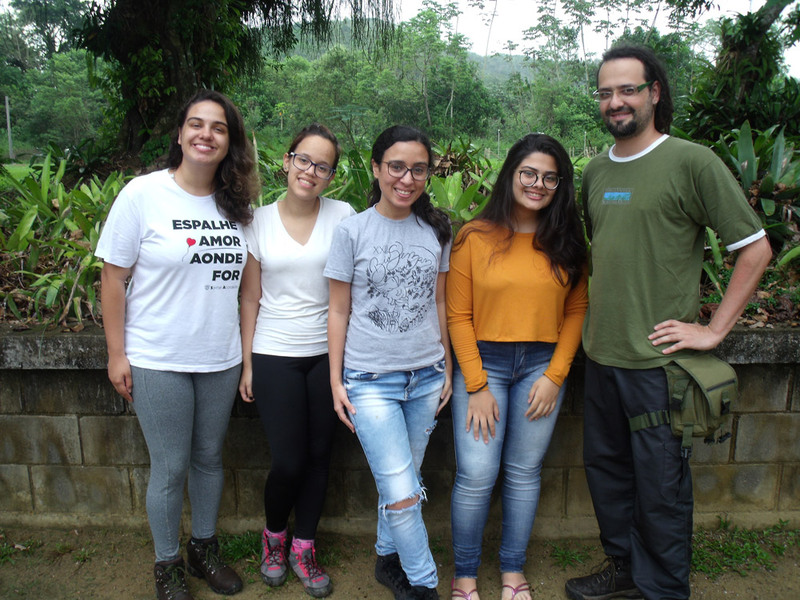 He is involved in compiling the Red data list of plants of the Atlantic Forest. Guarajuba wood was well known for its high quality timber which was used to for buildings and boats. Being valuable led to trees being cut down in huge numbers. There are six individual Guarajuba trees in the Botanical Gardens of Rio de Janeiro, but when botanists started searching in the forests around Rio city and in the best remaining tracts of forest, none could be found. It was thought that the species had been lost in the wild. However upon researching the Tijuca forest last year, botanists came across 28 examples of this very species. They had probably been planted in 1861-1874 when Major Archer spearheaded the reforestation of the degraded hill under Christ the Redeemer as its water sources had dried up. Pablo found some seeds under this tree and germinated them at home. He generously brought two examples for us to plant at front of REGUA. This is just terrific and short of opening a bottle of champagne to celebrate we are overjoyed that Thor could plant both the trees for us and hope that in a few years we shall also have seeds to plant elsewhere. 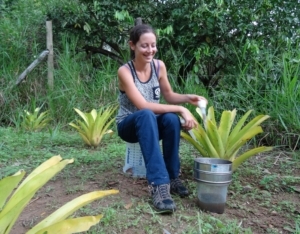 University student Juliana Leal is conducting a new experiment as part of her doctorate on bromeliads here at REGUA. 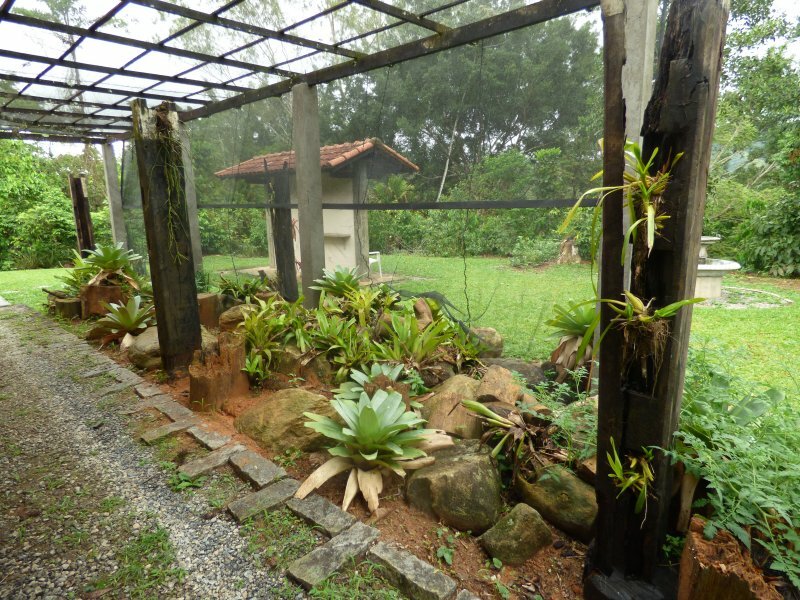 One thinks an epiphyte absorbs nutrients from their host but far from it, the roots of the bromeliads merely fix the plant to the branches, rocks or soil on which it lives. Leaves of bromeliads are fixed at their base in a circular arrangement that trap rainwater and any material falling from above on which algae thrive. Incoming sunlight powers the ecosystem, and aquatic organisms feed on algae in the bromeliad’s small pools, but ecologists are intrigued as to what is more important; the algae or the dead organic material falling into the watery habitat? 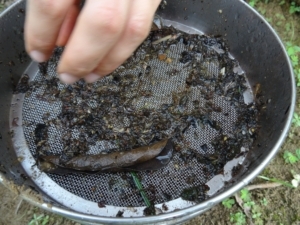 What maintains the flow of energy in an aquatic ecosystem, algae or the incoming organic material? 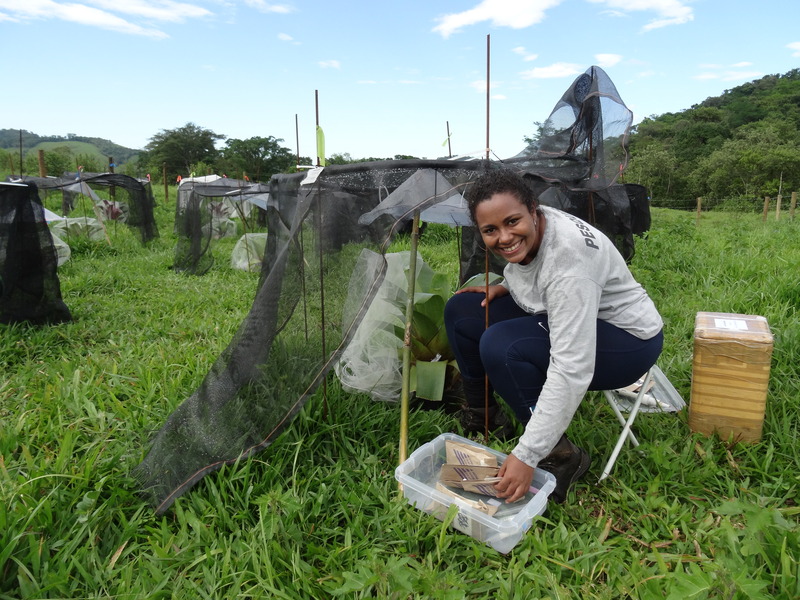 Juliana has set up a field of identical bromeliads at REGUA with different sunlight filters that allow varying levels of sunlight to reach the plant. As algae numbers increase with sunlight she can vary the sunlight and measure the number of invertebrates feeding on algae to build a correlation. But is there a minimal shade necessary? We shall have the answers soon. I have been researching the water lilies (Nymphaeaceae) found in Rio de Janeiro State, and here are my conclusions. There are five native and three non-native species of water lilies in the state of Rio de Janeiro. All five native species: Nymphaea amazonum, N. lasiophylla, N. lingulata, N. pulchella, and N. rudgeana, have white flowers. I do not recall seeing any white water lilies at REGUA. It is hard to say how common these white native species are, but they are definitely not rare. Some occur only in the Atlantic Forest region, from Bahia State to São Paulo and others widely distributed across South America. There is also one non-native species with white flowers, N. lotus. 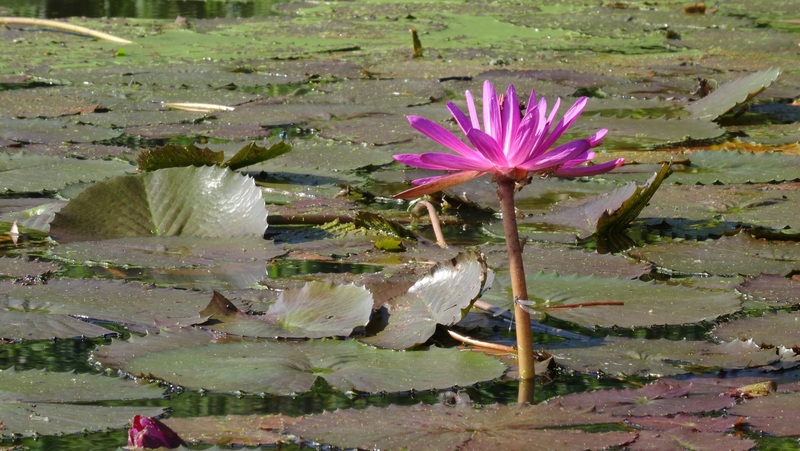 All of the “coloured” water-lilies in Rio de Janeiro are non-native. The light-blue flowered Nymphaea caerulea, the classical “lotus” of antiquity, is native to the Nile Valley and East Africa. It was introduced to India in ancient times and it is now naturalized throughout tropical wetlands, but is considered an invasive species in Australia. I imagine that N. caerulea is so widespread now its seeds or rhizomes are distributed by waterfowl, from wetland to wetland, but for some reason it does not seem to occur with native species, at least at REGUA. There is another light-blue flowered species N. capensis, but it appears to be synonymous of the former. 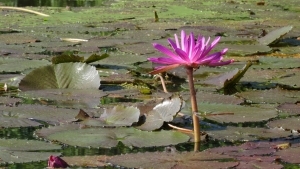 The reddish water lily N. rubra, is also non-native (a native of the region of south Asia though to Australia) and is probably an escaped cultivar. Apparently in it’s native range most of flowers are white and whitish, but reddish/purple variety is propagated by growers.